TrumpWatch, Day 604: Trump Turning Against Defense Secretary Mattis? Current and former US officials say Donald Trump is turning against Defense Secretary Jim Mattis, raising the prospect of the removal of a significant check on Trump’s impulsive behavior. 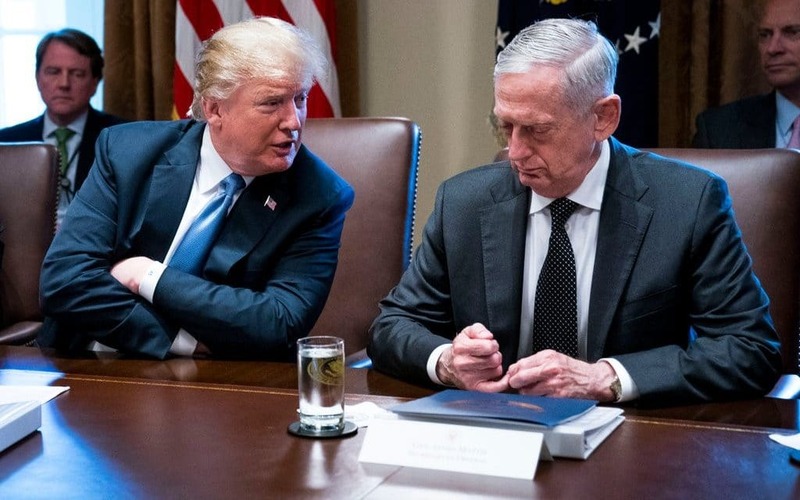 “More than a dozen White House, congressional and current and former Defense Department officials” told The New York Times that Trump is unhappy with Mattis, in part because of media portrayals of the Defense Secretary as the “adult” in the Executive Branch. Hamburger dinners between Trump and Mattis have ended, and some sources say Trump believes the four-star general is a “Democrat at heart”. The high-level appointments of Mattis, along with fellow former generals John Kelly and — from March 2017 — H.R. McMaster, were initially seen as a sign of experience and competence for a President who lacked any involvement with national security and military matters. But McMaster was forced out early this year as National Security Advisor, after months of being undermined by White House in-fighting and Trump’s temper. Kelly, who moved from Director of Homeland Security to White House Chief of Staff in July 2017, is recurrently said to be at risk of departure — some reports saying his foes are Trump’s daughter Ivanka and son-in-law Jared Kushner. Amid all the turmoil, Mattis had been seen as the one advisor sheltered from firing or forced resignation. He has kept a low profile over the controversies around Trump and has not openly confronted the President in cases of concern or disagreement. Earlier this month, extracts from Bob Woodward’s book Fear portrayed the Defense Secretary blunting Trump’s impulsive orders and saying he had the intelligence of a “fifth or sixth grader”. Mattis quickly put out a statement labelling the claims “fiction”. Earlier this year, Mira Ricardel — who has a history of anomisity towards Mattis — was appointed as a Deputy National Security Advisor. She joined the Administration as some White House officials began to whisper that the Defense Secretary may be asked to leave after November’s Congressional elections. Some aides said that Mattis is wearying of the amount of time that he has to push back against Trump’s ill-informed whims. Pentagon officials said Mattis’s strenous efforts to show loyalty have then been contradicted by Trump’s positions or stations. Some claimed that the question of h ow much longer Mattis can continue is now an open question among the Pentagon’s top officials. Two aides said that Trump — angered by the Woodward book and by the “Quiet Resistance” article by a “senior Administration official” in The New York Times — wants Mattis to be more like Secretary of State Mike Pompeo, a Trump loyalist. Sources noted a televised cabinet meeting on June 21, amid controversy over separation of immigrant children from their parents, when Mattis sat stone-faced on Trump’s left. In contrast, Pompeo — on Trump’s right — laughed at the President’s attempted jokes. NextTalkRadio: Week in Trump-Land — Can Economy Save Trump from Russia Investigation?